This was very tasty, and I don't usually like sangria (usually too sweet for me). This was refreshing and I really enjoyed the flavors. This was fantastic. Really wonderful flavors. The vinegar/dressing really brought out the best in the vegetables. Using 2 jalapenos definitely gives it a good kick, which I enjoyed. If you're less into spice, you may want to cut back on the jalapeno. Again, though it was perfect for my taste buds. I used slightly more than half the sugar called for - a matter of taste though. Followed Eynat Edmony's recipie basically for technique. Served with Michael Solomonov's amba tahini sauce which was fantastic. Adding the zatar Solomonov suggests to the schnitzel was very delicious. I added these techniques to the schnitzel breaking I normally make. Starting with tossing the chicken or turkey tenders in falafel mix instead of flour and using egg whites and a mixture of panko, matzah meal and breadcrumbs. Seasoned with powdered garlic, nigila black onion seeds, white sesame seeds and zatar. I used to live in Israel and I was craving Israeli couscous. This was a perfect recipe comes together very quickly and cooks perfectly. I added Israeli hot paprika and turmeric as she suggested and added some ground roasted cumin. Will make again. Hated these - just a mouthful of sugar. Needs to set up for about an hour before ready to use. Just wonderful! 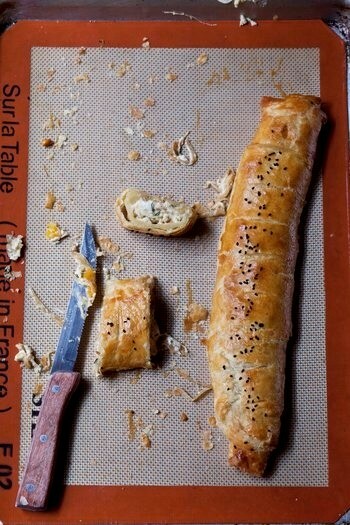 I made a copy of this for my file, it was excellent and the tahini sauce recipe is wonderful on so many things! Goes well on practically everything, but needs a cup of salt to go with that cup of sugar. I particularly like the way this book is set out, with dishes grouped under casual dinner party, quick and easy, recipes to feed your kids, recipes best enjoyed outdoors and restaurant-worthy dishes..
We've featured a fair amount of panna cottas and custards on Bake the Book. Their milky whiteness is the ideal backdrop to jewel-bright fruit sauces. And this malabi...is no exception. Mixing cardamom, espresso powder, and dark chocolate is powerful magic that can sustain any party. ...everyone who loves baklava has their own way to make it, and theirs just happens to be the best. 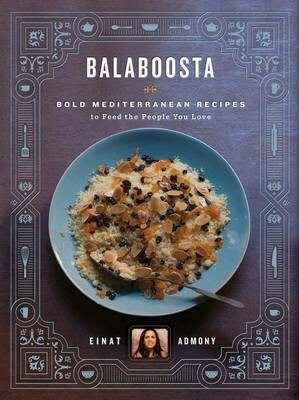 Chef Einat Admony might have an actual claim to the title. ...crisp, layered, and not too sweet. A Balaboosta - Yiddish for 'perfect housewife' - loves nothing more than feeding those she loves. Here, Einat provides all the recipes a 21st-century Balaboosta needs to feed all the people in her life, be it her friends, her husband, her children, her extended family, or the many people she wants to entertain. Recipes are a seamless marriage of the flavors of Einat's mixed Israeli heritage (Yemenite, Persian, Moroccan, and European) and the fresh, sophisticated tastes she learned while working in Manhattan's most serious kitchens. The result is a melting pot of offerings: harissa-spiced Moroccan fish; Spanish-style shrimp; grilled eggplant; chicken schnitzel; Persian rice; beet gnocchi; butternut squash and saffron soup and roasted broccoli, to name a few.